On 11th March 2011, the Great East Japan Earthquake (also known as "311 Earthquake") happened. Thirty minutes after the magnitude-9 earthquake, monstrous tsunami waves crashed into the whole region of the Tohoku shores. Many towns were destroyed and the death toll and number of missing people went beyond 20,000 at one point. The author of this book, Misukoso, watched the disaster unfold on television news and became deeply emotional by these sorrowful events. These comics are the author’s interpretation of the events based on true stories of the survivors and victims extracted from the local news. A dog who wouldn't separate itself from its owner even when the tsunami approached... and many more. The book consisted of nine short stories and an essay column. 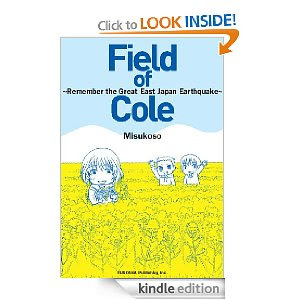 The title of the book "Field of Cole" was derived from the author’s experience when she went volunteering at a disaster site. Soon after the author uploaded a few of these comics on her blog, they became widely talked about over Twitter. Follow @misukoso (Tweets in Japanese). More than 30,000 people read the comics and were moved to tears reading these comics which got published in Japan later. Then, six months after the earthquake, the series of comics were published in Japan in a book form. As a condition for publishing the book, the author asked the publisher that all her royalties from the book be donated to the disaster victims and the book be translated into English and distributed as an e-book, so that people all around the world will have the opportunity to know more about people affected by the Great East Japan Earthquake and their experiences. We hope this comic e-book will help the readers think about and remember the people in Tohoku, who are toiling in the long process of recovery. Misukoso was born in Niigata prefecture. After graduating from the Faculty of Policy Management of Keio University, worked for a while, and went back to school doing her Waseda University Graduate School of Accountancy. As she describes herself on her Twitter profile (@misukoso), "会計系の大学院生。自意識をこじらせたオタク。著書「いつか、菜の花畑で」（扶桑社）。生い立ちについては、このページを御覧下さい。"